Introducing the the NEW Akemi Impregnation Remover. The ultimate product to remove all penetrating impregnators, sealers, or enhancers. Why would you want to scrub? This product has a gel consistancy and is strong enough to remove the best stone treatments. Easy To Use & clean-Up! Akemi Impregnation Removeræcan remove enhancing products such as Agers and Darkeners that did not give the desired enhancing effect. It removes solvent and water-based impregnator treatments as well. This remover is best for restoration projects and can be used to effectively remove new, uneven, or old treatments. Remove all deep penetrating products. The only things you need to use are water and a brush to remove the product from the stone surfaces when the stripping process has finished. Concentrated, gel-like, highly alkaline cleaning agent, without odour and solvents.æIt is also biodegradable! It is designed to removes stains caused by impregnations, as well as heavy dirt like residue of lacquers on natural stone, concrete, ashlar and clinker. 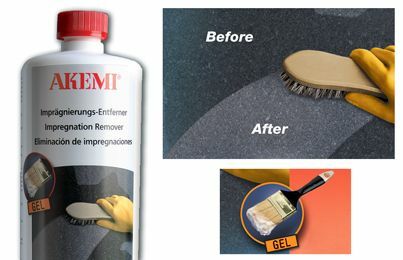 This great remover is suitable for horizontal surfaces as well, like floors and table tops and vertical applications of facades and wall coverings due to the gel-like consistency. Note:æImpregnation Remover corrodes polished marble, limestone, resin-bonded artificial stone and terrazzo, as well as eloxal and enamel. Do not use it on artificial stone, which is sensitive to alkalis, painted surface or similar. If in doubt, test on an inconspicuous area.